When choosing the top 10 family-friendly ski resorts in the USA, we took several factors into account. First, the ski resort had to deliver on a perfect ski-in/ski-out experience. No family wants to be schlepping gear! Second, the resort had to offer terrain and lessons for all ages and skill levels. And it had to offer day care options for those kids who are too young to hit the slopes all day. Third, the location had to have a range of family-friendly accommodations from budget-friendly condos to luxury hotels. And finally, the ski resorts on this list all have off-slope activities for either non-skiers or non-boarders in the family or for those who just need a break from the lifts. So read on to find out which resorts top the list! Editor’s Note: These destinations are in no particular order. It’s hard to imagine a ski destination more geared toward families than Park City Mountain Resort! Kids can start linking their first turns in Kids Signature ski school or practice tricks in the "I Ride Park City" freestyle camps, where they create videos of themselves at the end of the day. Or ski as a family through tree-lined Adventure Alleys on a Snowbug Treasure Hunt. Kids (6 and under) ski free. Child care is available for non-skiers. Hop on the Alpine Coaster or Flying Eagle Zipline. Take an evening sleigh ride to the Viking Yurt for a hearty cowboy dinner. 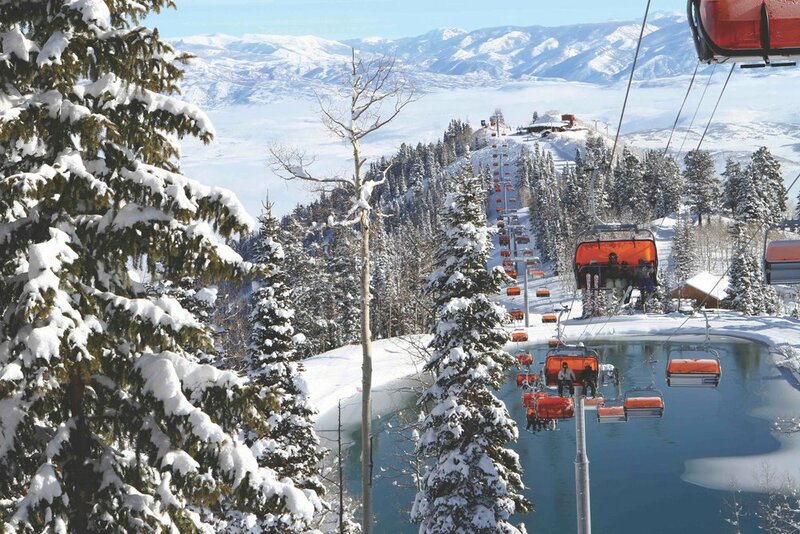 Park City is just minutes from two other world-class ski areas: Deer Valley and Canyons, plus Utah Olympic Park. Consider booking your vacation rental from Tripbound. As a KidTripster fan, you get an extra 10% off when you reserve through this link. Read our full review of Park City here. Has your child been dreaming of “shreddin’ the gnar?” There’s no better place to learn than Northstar. Overlooking the brilliant blue waters of Lake Tahoe, the resort sports 100 trails and seven terrain parks, including the 22-foot Superpipe - designed by Olympic gold medalist Shaun White - for skiers and snowboarders alike. Young children can learn to ski or ride in Ripperoo Riglet Park; older kids can enroll in Burton Snowboard Academy. Children (4 and under ski) free. Child care is available for non-skiers. Enjoy bungee trampolining, cross-country skiing, and ice skating. Paint pottery and design your own candles in the village. Or stay up past your bedtime for moonlight snowshoeing with fireside s’mores and hot cocoa. For optimal ski-in/ski-out convenience, stay mid-mountain at Constellation Residences. You’ll get complimentary use of neighboring Ritz Carlton’s pool and fitness center. To read our full review of Northstar, click here. Calling itself Colorado’s "Last Great Ski Town," Crested Butte is a fantastic destination for active young families. One parent literally can ski to the front door of the Trailhead Children’s Museum and switch off with another parent who’s playing with a non-skiing child inside. Or enroll your kids in the resort’s reasonably-priced ski or child care programs. Of course, nothing is stopping you from skiing as a family on the perfectly-groomed slopes. Kids (6 and under) ski free. Choose from dog sledding, cross-country skiing, horseback riding, snowmobiling, and snowshoeing. Spend a kids’ night out at the Adventure Park, complete with bungee trampolines and tubing. Or take a sleigh ride to Uley’s Cabin for a Colorado-inspired dinner of elk, braised lamb shank or Whiskey River salmon. Delicious! Consider The Lodge at Mountaineer Square as your home away from home. To read our full review of Crested Butte, click here. One of the country’s premier ski destinations, Vail is patterned after the Swiss town of Zermatt. Families stroll down its pedestrian-only, heated streets to world-class restaurants and shopping. On the slopes, enjoy one of the many Adventure Zones, specially-designed runs for newbies still building their confidence. Kids (4 and under) ski free. Child care is available for non-skiers. Vail boasts one of the most unique, kid-friendly snow parks at Adventure Ridge, including kid-sized snowmobiles, ski bikes, trampolining, and tubing with an easy, covered lift. Trivoli Lodge provides cozy luxury with its ski valets, steaming outdoor hot tub, and free cookies each afternoon. Make sure to scratch the hotel’s mascot, Speed - a chocolate Labrador - behind the ears. When traveling with kids, free is a good thing. At Copper Mountain Resort, it starts with freestyle lessons (ok, you do pay for those) at Woodward’s terrain parks in the morning; in the afternoon, kids head inside The Barn for training on mini ramps, spring floors, foam pits, and trampolines. Kids (5 and under) ski free. In the evening, the resort offers free child care, as long as Mom and Dad spend $30 at the resort that night. The freebies continue! There’s free snowcat rides, snowshoe tours, ice skating (pay for skate rental), hockey, and broomball. With all the money you saved, splurge on a ski-in/ski-out vacation home rental. To read our full review of Copper Mountain, click here. Known for being steep, deep, and spectacularly beautiful, Jackson Hole Mountain Resort is an advanced skier’s rodeo. Here, the blue runs ski more like black diamonds at other resorts. That being said, there are few long groomers where inexperienced skiers can learn. Kids (5 and under) ski free. The Kids Ranch offers camp programs and child care. (For lunch, the Ranch serves only free-range meats!) And anyone can ride the aerial tram to the summit and eat hand-held waffles while watching paragliders soar through the sky. Maybe you’ll take the leap yourself! Choose from dogsledding, ice skating, snowshoeing, snow kite boarding, and tubing. Or bundle up for a sleigh ride through the nearby National Elk Refuge. For an authentic western feel, stay at Teton Mountain Lodge & Spa. For more on Jackson Hole, click here. Rather than the red carpet, Steamboat rolls out little red wagons to help families with small children and all their gear. Just load 'em up and move ‘em out to the western-themed ski school with kids-only lifts and terrain parks. Kids (12 and under) ski free, if parents have purchased 5-day lift tickets. Child care is available for non-skiers. Try bungee trampolining, snowmobiling, and free guided snowshoe tours. Or dash through the snow in a sleigh pulled by a pair of majestic draft horses. For luxury, consider Steamboat Grand; for ski-in/ski-out access, try Sheraton Steamboat Resort; for value, book Hampton Inn & Suites. Or consider booking a vacation rental from Tripbound. 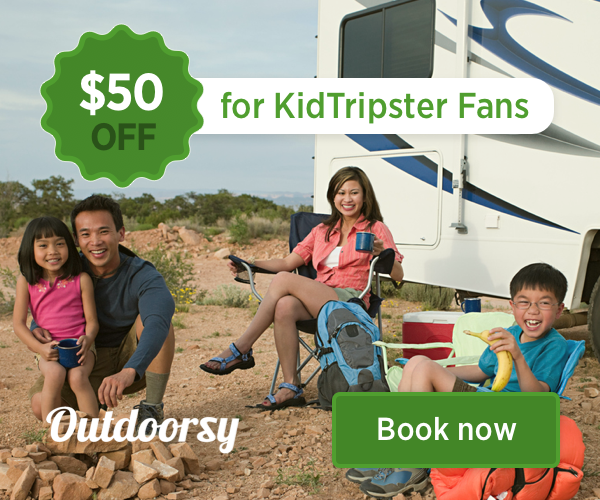 As a KidTripster fan, you get an extra 10% off when you reserve through this link. Please know that we love its properties so much that KidTripster has partnered with Tripbound as an affiliate. That means if you use our link to book, we get some coffee money from them. There’s no additional cost to you. Just wanted you to know. To read our full review of Steamboat, click here. Beaver Creek Resort prides itself on attention to detail, even employing a team of guest service ambassadors to meet your every need. While everyone is welcome at the resort’s ski school, girls (ages 7 to 12) can enroll in Ski Girls Rock!, a program designed by Olympic and World Alpine Champion Lindsey Vonn. Kids (4 and under) ski free. After a day on the slopes, follow your nose to the base of Centennial Chairlift for free, freshly-baked chocolate chip cookies. Child care is available for non-skiers. Enjoy bowling, bungee trampolining, cross-country skiing, dog sledding, horse-drawn sleigh rides, ice skating, tubing, and free family snowshoe tours. The Osprey is modern but cozy and just steps from Strawberry Park Express Lift and village shopping. To read our full review of Beaver Creek, click here. 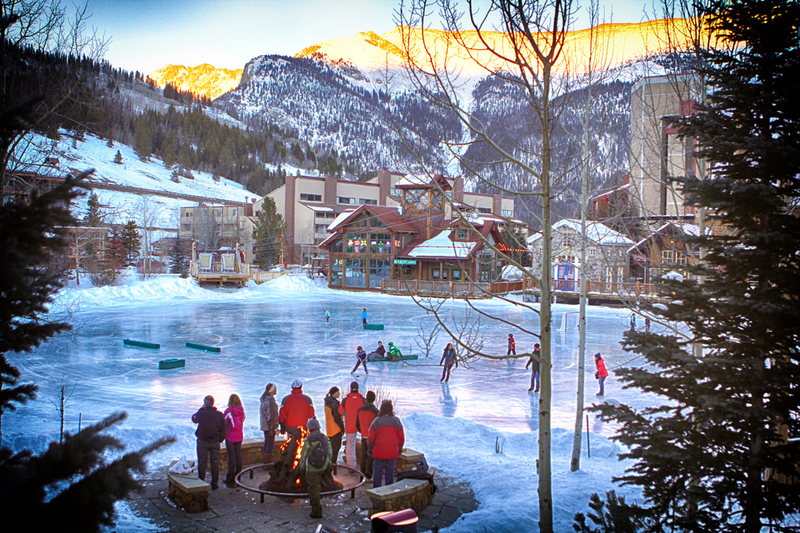 Winter Park Resort caters to both parents and children alike. If you enroll your kids in ski school, you’ll be able to keep tabs on them with nifty GPS-tracking devices. Kids (5 and under) ski free. In the evening, you can enjoy a romantic night out, while the kids have their own night out at the Children’s Center, complete with dinner, games, sledding, and movies. On the village rink, you’ll find free skate lessons, broomball, and Disco Skate Nights, plus tubing and evening s’mores around the fire. Choose a condominium at Founders Pointe and Fraser Crossing. You’ll be just steps from the lifts and village. With over 5,800 skiable acres, Big Sky Resort is the largest ski area in America. While it offers some of the best advanced terrain in the country, there’s also an extensive network of beginner and intermediate trails. Here families can relax and enjoy laid-back, small town hospitality with no crowds. Kids (5 and under) ski free. Child care is available for non-skiers. 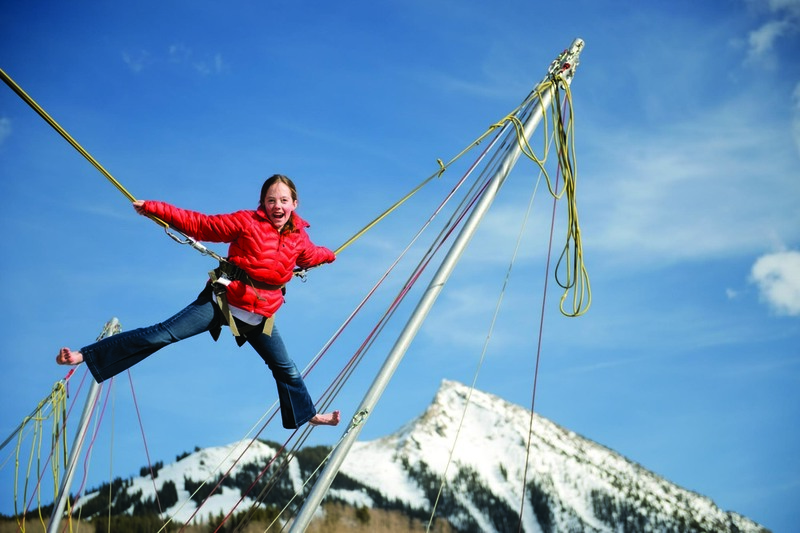 Go bungee trampolining, cross-country skiing, snowmobiling, snowshoeing, and tubing. Big Sky is just 50 miles from Yellowstone, one of America’s best-known national parks. Plan to spend a day looking for bighorn sheep, bull elk, and bison. And catch Old Faithful geyser, free from summer crowds. To read more about Big Sky, click here. Editor Shellie Bailey-Shah and her family live in Oregon, where they hone their ski skills on Mount Hood.